Sentinel Squad with E-Web Hoth cannon photo op. Based in Ten Forward bar all weekend, a place to chat and get 1:1 tuition from the authors of SFS. Toys, collectables and perfectly packaged plastic crack to suit all tastes. Scarborough Gaming Society with 10 tables packed with marvellous minature tabletop games. Go throw a D20! Live acoustic music from The Underground Music Collective from 11am till 4pm both days. 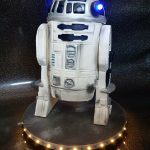 Win this lovely R2-D2 creation from Kreative Kakes over the weekend at Sci Fi Scarborough. The beautiful Victorian Grand Hall plays host to our main guests, comic book artists, photoshoots, crafters, freelance artists, authors, Leeds/Bradford Starfleet with their amazing NCC-1701 D bridge set and much more…. Guest panel talks held in the 600 seater Victorian theatre throughout both days.